Deepening dusk in early winter, dense snow keeps falling. On mountains in all directions, [we see] no cypress or pines. Stop discussing snow depths, and the sinking gloom. I want this to be like Caoxi Peak on Mount Song. Stop discussing the amount of snow whether it is much or not so much. I wish [this scenery] is like the Caoxi peak of the high mountain, Song. Moto (孟冬) refers to the beginning of the winter, that is, 10th month in lunar calendar; November to December in solar calendar. Missetu (密雪) refers to heavy snow falling continuously without making any sound. When winter comes to the Hokuriku district where Dogen lived, the north wind from Siberia brings humid air from Japan sea. The wind hits the high mountains, goes up, freezes, and comes down as snow. Each winter, people in this region have huge amount of snow. Sometimes they have more than ten feet of snow which may cover the entire village unless people continuously remove the snow on the roofs and streets. In the second line, Dogen describes the mountain scenery completely covered with white snow. The differences among various kinds of trees such as cypress, pine, and many others cannot be seen. In the third line, Dogen asks his monks not to discuss and complain about how much snow they have and how cold, humid, and gloomy the world has become. Inki (陰気) is yin-energy (as opposed to yang-energy) which makes the world cold, dark, humid, and living beings inactive, gloomy, and even depressed. Ancient Chinese and Japanese people thought that from autumn to winter, yin-energy becomes stronger, and from spring to the summer yang-energy becomes stronger. In Chinese philosophy, yin and yang (dark-bright, negative-positive) describe how seemingly opposite or contrary energy may actually be complementary, interconnected, and interdependent in the natural world, and how they may give rise to each other as they interrelate to one another. At that time, it was the final month of a year, and a very cold day. It is said that it was the night of the 9th day of the 12th month. Even if it was not heavily snowing, the winter night in the deep mountains is not a place a human being can stand on the outside ground. It was a dreadful time of the year; even a joint of bamboo would be broken [with cold]. Therefore, a huge amount of snow covered the entire earth, both mountains and peaks. He sought the Way in the snow. We cannot imagine how hard it was! 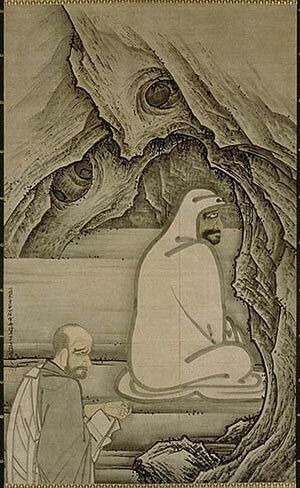 Huike was not permitted to enter Bodhidharma’s room (another version says that Bodhidharma was sitting in a cave). Huike kept standing in the snow almost until dawn. During that time, Huike remembered how past bodhisattvas practiced without thinking of their own bodily life, such as the bodhisattva who offered himself to a hungry mother tiger to help her seven cubs, etc. Then Huike thought to himself, “Ancient people with great capability and determination were like that, then who I am?” Huike made his aspiration stronger. Later, when he talked with Bodhidharma, he cut his arm to show his determination. I think this is what Dogen Zenji wants to say in this Chinese poem to his disciples. Even when the entire world is cold, humid, and gloomy, we should think of how ancient bodhisattvas practiced and renew our determination, instead of being overwhelmed and complaining about the weather. Probably Dogen was also encouraging himself. These days, at some Japanese Soto Zen monasteries, right after Rohatsu sesshin is completed and after performing a ceremony celebrating Buddha’s Enlightenment on December 8th, they hold a Danpi (cutting-arm) sesshin and sit all night until the morning of 9th. (Dogen’s Extensive Record 10-87, p.635) © 2010 Taigen Dan Leighton and Shohaku Okumura, Dōgen’s Extensive Record. Reprinted by arrangement with Wisdom Publications, Inc., http://www.wisdompubs.org. Translation and commentary by Shōhaku Okumura Roshi. This entry was posted in Dogen Zenji’s Chinese Poems, Dōgen Poems and tagged Bodhidharma, Dogen, Dogen Zenji’s Chinese Poems, Eihei Koroku, Eiheikoroku, Huike, Mt. Song, Okumura, poetry, Shaolin, Shobogenzo, Shobogenzo Gyoji, Shohaku Okumura, zazen, Zen on November 25, 2018 by davidthompson1685. I think this poem goes nicely with the poem you posted earlier “Snow” in “False and True, Good and Bad”. “In our lifetime, false and true, good and bad are confused. For many years I merely saw that mountains had snow. Reading this poem reminds me of a reference. In the Theravada traditions, in the Mahajanaka Jataka; the Bodhisattva is shipwrecked in middle of the ocean. Without land sighted in the ten directions, all he can do is just swim. Theravada traditions mentioned that was the lifetime that the Bodhisattva cultivated the perfection of determination (virya paramita).